Unlike U.S. leaders, those in Germany and elsewhere were not impressed by Monsanto’s well-known intimidation tactics. By January 2013, eight European nations had publicly banned the cultivation of genetically modified crops. Earlier this month, these and other European countries joined the massive March Against Monsanto, a global event that saw millions take to the streets in protest. For Monsanto, this latest action was apparently the last straw. Despite Europe’s strong stand against Monsanto’s GE crops, there are plenty of countries still under its financial and political control, namely, the United States. Here’s hoping that Europe’s victory will be only the first chink in Monsanto’s armor — one that can be exploited by the relentless voices of the millions of Americans who don’t enjoy a corporation deciding what they can and cannot eat. Monsanto et al are trying to get GM crops in Europe again and we must stop them! No gmo's and no ge's please! 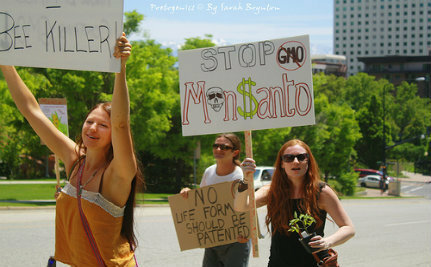 They never should have existed, so people are going beyond the call of duty to stop the gmo's and to stop the ge's. Thank you for the excellent news! We need to force Monsanto to surrender in the U.S. as well. NO GMO food in our markets and elsewhere!! !